Thanks to all your good wishes,the one day class went well .We started off with great enthusiasm,covered a lot of basics,chatted away,helped each other with the stitches ,offered suggestions and thus had a great time .There were seven of us and it was a chance for everyone with common interests to bond .New friends were made and phone numbers exchanged. Now Iam planning a workshop in another city Chennai on September 4th.The details are here. 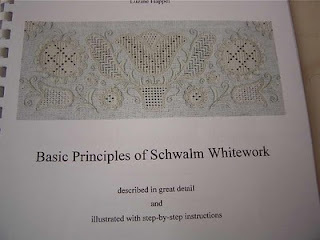 As the cover rightly says,Luzine Happel has described each and every step of this wonderful German Whitework that originated from the village of Schwalm. The book,especially the cover ,looks very simple and unassuming. But the contents...oh my!!! I've a treasure in my hand. The book revolves around one single project - whitework on a table cover. 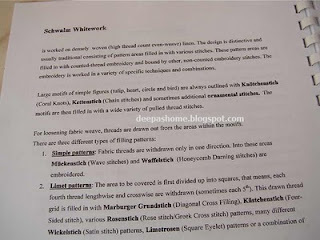 Initially,when I started with the overview of Schwalm Whitework and read about KettenStich, Waffelstich ,Grundstich, my heart sank. Oh goodness,what's all this?? and like all the intelligent people out there I skipped the first two pages :) Iam an absolute newbie and I was a bit overwhelmed with the German names as well as their English equivalents. 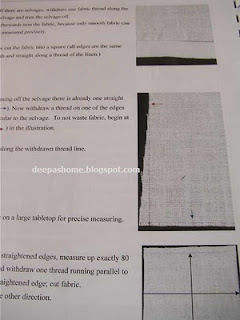 She has assumed the reader to be an absolute newbie and has even explained how to find the count of the Linen and even how to cut the fabric straight. Now for the stitching part. Each stitch has been described in detail with individual photographs. 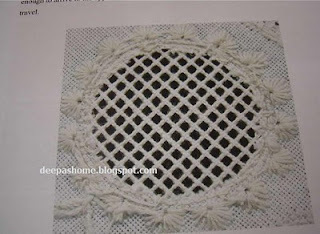 Now who wouldn't want to do a openwork like the one above? 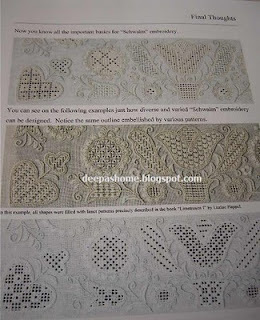 yum..yumm..
Each part of the said pattern and the stitch for each is covered in detail. And finally, a comparison of the same pattern stitched in different ways. I just love the way the whole material is presented.The book costs about 29.9 Euros (approx 2000 Indian Rupees,may vary with the exchange rate).I saved the shipping since it was delivered within Germany itself. Since I did not have any idea about the cloth and the threads,I ordered those too from her. Coton a Broder is not available here in India. But Iam told that Anchor Perle Cotton can be substituted for this.I've not yet checked it out,but will let you know once I do. 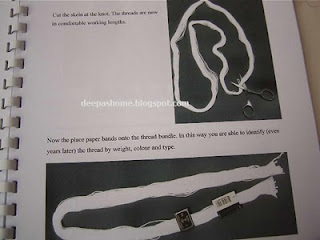 So,this is going be my next attempt :) I do have plans for a brazilian embroidery piece too.Will let you know soon . It looks beautiful! Can't wait to see what you create. so when is this shwalm class??????????????? ?i would need the book, how do i pay you? Great review and a truly generous offer to try and get the book for us. 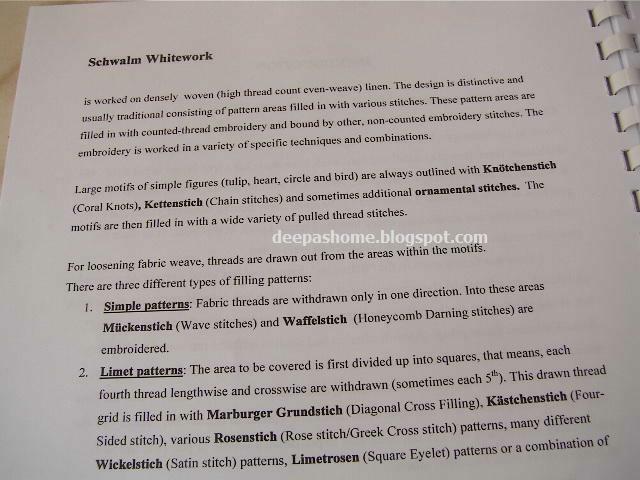 Hello Deepa, i have just read your your post about Schwalm Embroidery. You are going to LOVE it. The book you have is perfect it seems to go into so much detail that I know is needed. Re the threads yes you can use the Perle cotton in both number 8 and 5.
you did not mention the fabric but if you can get a linen called Dublin linen that works beautifully with schwalm. I actually did a table cloth of an evenweave wool/poly mix which turned out well. 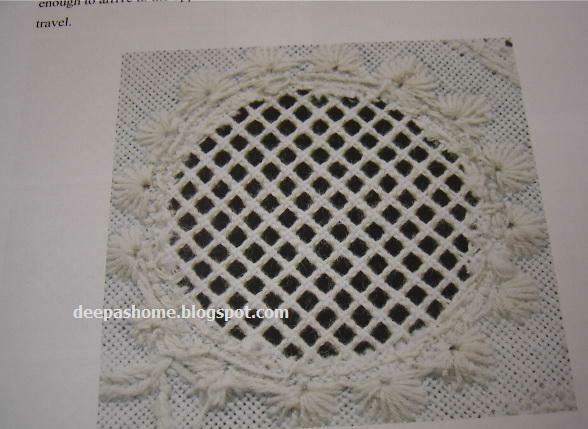 I have photos of it on my page on stitchinfingers...and maybe on my blog will have to check. So glad you have discovered this work. 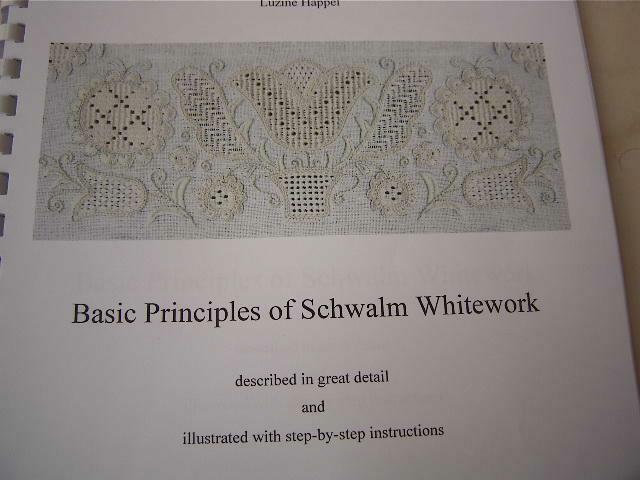 I have a book called Schwalm Embroidery by Christine Bishop which has small projects. But if you can get hold of the English Magazine called "Anna" they always have a lot of lovely projects. Happy stitching you are going to have fun and will get a renewed lease of life. 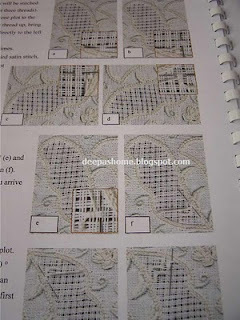 Great review...Hope to see you create them very soon...BTW i just stumbled upon this link- http://www.thehindu.com/news/cities/Chennai/article511113.ece?homepage=true... someone(from Chennai)might be interested in having a glimpse of these colorful embroidery. my grandmother used to work that kind of work. i still have some line dresses with embellished fronts. back home it was linen, but it could be colored. needlework always white, though. I've not heard of this embroidery. wish you good luck..and let us know of your venture. I was asked to buy a copy of Luzine's book for our embroidery guild library. There is an English version available from Luzine. I have recently completed the cloth and am delighted with it. The only stitch I got stuck on was one of the rose stitch fillings. I had to go to a stitch dictionary to be able to work it out. I did have a small coloured project on the go at the same time though! I seemed to need a frequent colour fix while doing the whitework. Do we get Needlethreader in Bangalore? 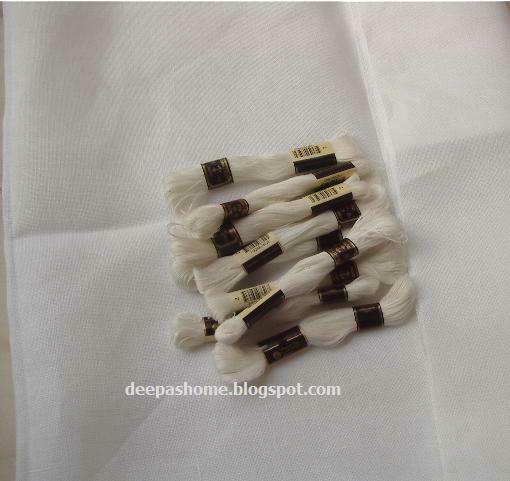 Do we get in any shop where we can get embroidery threads? 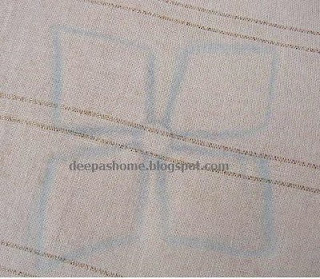 Yes,we can get it from the same shop where we get embroidery threads. Have you seen the set of various needles sold in a round box ? That box comes with a needle threader on the top. Great review Deepa. Thanks for sharing your thoughts!